Welcome. 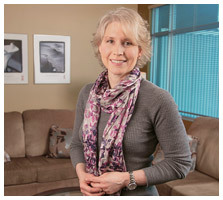 Dr. Tanja Haley is a psychologist in private practice at the Valley Ridge Chiropractic & Wellness Centre in Northwest Calgary. Tanja is pleased to offer individual and/or couples counselling tailored to meet your needs, and she is also a Certified Gottman Therapist. If you have a challenge you would like to tackle, an objective you would like to reach, or a relationship you want to improve, she will work with you to make your goals a reality. Tanja's commitment is to support you, motivate you, and even challenge you as you strive towards making the changes that will make the difference in your life. Don't just live life, make it happen. What is the No Risk Coffee? Dr. Tanja Haley is one of a handful of Certified Gottman Couples Therapists in Canada, as well as a recognized Art & Science of Love Workshop Leader. Tanja is also Certified in Dr. Sue Johnson's Emotionally Focused Couples Therapy, which is very complementary to the Gottman Method. These approaches to couples therapy are well-researched, and Dr. Tanja is one of only two therapists in Canada to have achieved both certifications. If you would like more information about the services she offers working with couples as well as individuals, please feel free to contact her. The Art and Science of Love Weekend Workshop for Couples in Calgary, AB facilitated by Dr. Tanja Haley and Dr. Brad Hagen. Based on over 40 years of research with thousands of couples and developed by Drs. John and Julie Gottman, The Art and Science of Love will give you new insights and research-based skills that can dramatically improve the intimacy and friendship in your relationship and help you manage conflict in a healthy, positive way. You can watch Dr. Tanja's short video for more information. One of Dr. Tanja's passions is to share her knowledge of psychology and relationships. She would be happy to talk about topics that you might be interested in so feel free to send her a note. Check out the latest video about the upcoming Art & Science of Love Weekend Workshop on Dr. Tanja's Videos page. Would you like to stay connected to Dr. Tanja? Check out her Youtube channel, Facebook Page, or follow her on Twitter.